Perhaps this is one of the most important lessons that Augsburg theatre students learn. Through participation in AugSem, the Artist Series, internships, and by attending some of the hundreds of productions staged throughout the Twin Cities every year, students are challenged to go away from Augsburg, and sometimes outside of their comfort zones, in order to make connections in the theatre community. From the beginning of her Augsburg education, Tessa Flynn ’05 says she was encouraged to get involved in the city. A theatre arts and mass communication major, she was particularly interested in the role of theatre in the public school system. She was fortunate to land an internship with the Children’s Theatre Company following her sophomore year, an opportunity that served as her introduction to critical literacy in the classroom. Before Flynn’s last year of school, sociology professor Garry Hesser encouraged her to get involved with the Project for Pride in Living college house in the Phillips neighborhood. She lived there with other college students and tutored middle school students from the community. “I saw that my students needed to break a cycle of violence and poverty, and I became even more convinced that theatre could be an important part of that process,” Flynn says. Katie Koch ’01/’05 also made many connections in the city that led her on a circuitous path—from campus to downtown Minneapolis to New York and back to Augsburg with a few more stops in between. Koch started out as a music major, but when her high school drama teacher took a position as stage manager at Hey City Theatre, longtime home of Tony n’ Tina’s Wedding, Koch was given an opportunity to assist him. She says it was the advice of Sonja Thompson, a piano instructor and vocal coach at Augsburg, that finally convinced her she could leave the music department. 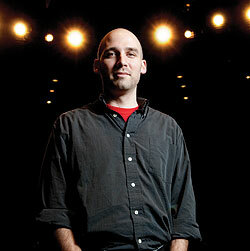 “She said, ‘You’re doing all this work in theatre … you don’t have to be a music major,'” Koch says. Instead of declaring a new major, Koch left school to stage manage the next show at Hey City, Smokey Joe’s Cafe. She then became an assistant stage manager for the Minnesota Opera, went on to work with Glimmerglass Opera in Cooperstown, N.Y., and freelanced as a stage manager from Milwaukee to Miami. Eventually she came back to Augsburg and completed a degree in theatre. 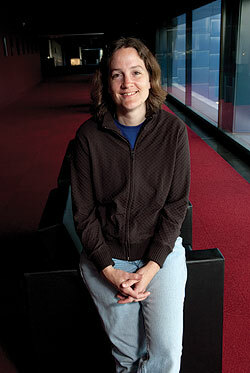 After school, Koch worked at the Ordway Center for the Performing Arts until a friend encouraged her to respond to a posting for the assistant to the director of the Guthrie. She went through several interviews including a very brief interview with Joe Dowling who, she says, asked her mostly about the professionals she’d worked with in her career. “I guess he’d already made the decision to hire me,” she says. She’s worked with Dowling now for three years. Koch maintains connections to Augsburg, sometimes serving as a guest lecturer and hosting Augsburg student groups who visit the Guthrie. Each year many aspiring actors come to Augsburg hoping to make a name for themselves onstage. And while many do just that, they also sometimes discover and develop their calling to work behind the scenes by getting involved backstage. This was the case for Lee Fisher ’06, Michael Kelley ’05, and Justin Hooper ’07. All three were very talented actors who performed in a variety of roles while at Augsburg, but each one also learned a lot about his craft while working on the technical side of shows. Today he directs two major productions a year and frequently draws on his connections with Augsburg theatre faculty for advice about organizing shows. He’s sought out professors Michael Burden ’85, Martha Johnson, and Darcey Engen ’88 for help on developing a curriculum and organizing a show, and he says he wouldn’t be able to do what he’s done without their help. Fisher also stays in touch with education and English faculty who were instrumental in his education because he values the professional connections. “I knew my experience at Augsburg wouldn’t end after graduation,” Fisher says. He adds that his Augsburg professors continue to be sources of guidance and friendship. 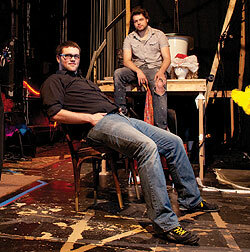 The connections they made while studying theatre at Augsburg have contributed to their busy and sometimes complicated professional careers. Since graduation, they have acted in and directed shows, painted and designed sets, and written original and adapted works. They’ve been from Winona, Minn., to Acadia, Maine, and back. And now, in addition to maintaining their day jobs, the two are putting their blood, sweat, and tears into managing 3AM Productions, a small local theatre company. It takes more than theatre majors and faculty and staff to stage a production. Often many non-majors get involved in theatre in college but don’t end up in “the business” until later in life. Carla Steen ’91 is one student whose path to professional theatre went through the English and history departments at Augsburg. As a first-year student, she ran the light board for Julie Bolton’s production of Macbeth—with a set designed by Burden (then a graduate student at the University of Minnesota) and starring Engen as Lady Macbeth. But that was the end of her participation in theatre at Augsburg as a student. Instead, Steen, who has worked at the Guthrie for 12 years as a dramaturg and publications manager, studied literary criticism with English professor Doug Green and worked on a senior honors project under his direction. She also researched Shakespearean history and sources for her history senior seminar taught by Richard Nelson, now professor emeritus. “In many ways, that was the beginning of me thinking that research for theatre was an interesting thing I could do,” Steen says. 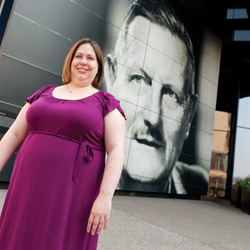 During and after college, Steen worked in the box office at the Ordway Center for the Performing Arts. An actor friend there suggested she become a dramaturg, and eventually she went to Columbia to pursue an MFA. Today Steen says it is interesting to come back to Augsburg because as a student she wasn’t really involved with the theatre department. She has taught and been a guest lecturer at the College, and she tries to see at least one production a year. Though Lilledahl took courses to obtain a minor in theatre, she felt the need to study in a more lucrative field. “I remember hearing voices saying, ‘You have to pay the bills and have a reliable income. 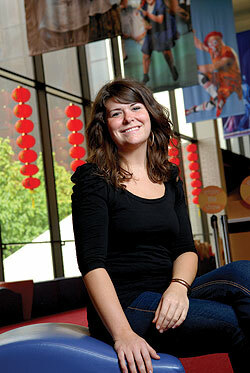 '” Lilledahl majored in communication and public relations. After graduating and working in corporate public relations, she decided to try the “comedy thing,” so she started taking improvisation classes and met her future husband, John Sweeney. Eventually she jumped off the corporate ladder so that she and Sweeney could pursue their dreams, and the couple moved to Chicago and worked at The Second City. 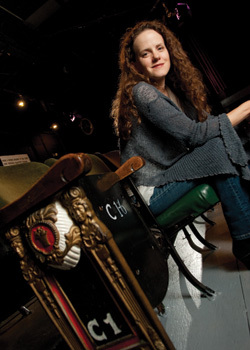 As the current co-owner of Brave New Workshop and executive director of the Brave New Institute, Lilledahl oversees the theatre’s school, which reaches more than 150 students a week, and she conducts improvisation workshops around the country. She is also on the board for Gilda’s Club Twin Cities, an organization that provides emotional and social support for families impacted by cancer. Lilledahl returns to Augsburg at least once a year to speak in chapel. Often her advice to students, which she says is based on years of seeing who gets work and who doesn’t, is to get as much stage time as they can—wherever, whenever, and however—and to have a life outside of the theatre. “We hire people because they are active and are creating their own work, not waiting for someone,” she says. “And they also have some other passions that aren’t about theatre.” Lilledahl adds that an actor’s experiences outside of theatre help them bring life to a script and creativity to the stage. And perhaps that is what makes all these alumni successful. 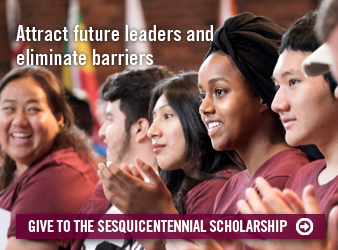 At Augsburg students are trained as actors, directors, and technicians, but they also learn how to become involved in their community as artists and as informed citizens. They understand that making connections is important to their careers and to their personal lives as well. They’re encouraged to explore many aspects of theatre, to develop their craft, and to work and learn at Augsburg and in the city. More than blocking and movement or scene study and character analysis, these are the lessons that will stick with them as they make their mark on the world’s stage.